This is really quite stunning. If IRON MAIDEN decided to play grindcore it would sound something like FULL FRONTAL ASSAULT. Pleasant-sounding, almost delicate traces of melody serve as intros and counterpoise to an otherwise unbridled aural assault. The music has a complexity and intricacy rarely heard in grindcore that is obviously informed by many an hour listening to virtuoso metal. I'm not talking math metal here. I'm talking ferocious and unremitting power violence flavored grindcore - with added textures. The CD features a few surprise goodies as well. There is a hidden track that is a well recorded live cover of SLAYER's Angel of Death. There is also an autoplay video for the first couple of tunes that shows the band in full raging glory on stage. It is worth noting the video is a bit disturbing with numerous clips of atrocious gig violence including multiple shots of immensely macho pinheads ganging up in several-on-one attacks including kicking and beating people who are down. 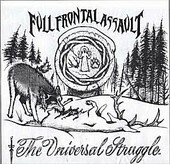 Judging from the lyrics and the album cover art it seems that FULL FRONTAL ASSAULT are using the imagery to demonstrate that humans aren't much removed from animals in their savagery and butchery. The obvious point, although possibly missed, is that man has the ability to be more, so there isn't much excuse for being less.